Chouette – Franck has started posting his photos now that he is on french soil! This was taken somewhere in Paris I think. 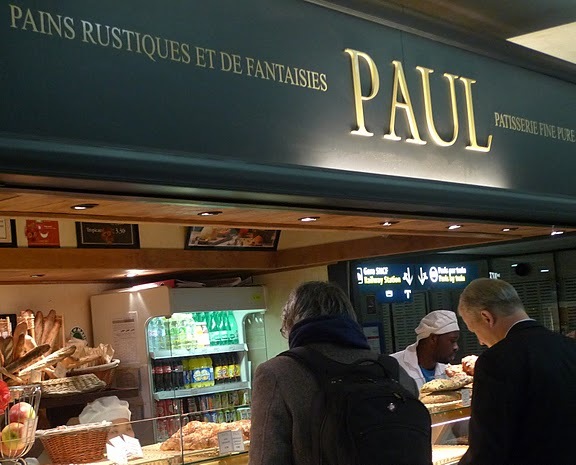 The chain of “Paul” shops all over France sell wonderful breads, sandwiches, pastries, and macaroons for a quick, delicious, inexpensive French meal. Far more appealing to me than a Coke and a Big Mac! Look for their Green signs next time you are in l’hexagone. This entry was posted in Burgundy and France Travel Info., Burgundy Restaurant Reviews, Uncategorized on November 13, 2010 by admin. Ma Cuisine is emblematic of Burgundy, and especially Beaune, in its obsession with good wine. When we went to Tuscany three years ago we took along a Rick Steve’s guide. The corner of Tuscany we chose, however, was rather obscure so the only time we pulled out “The Rickster” was during a day in Florence. We used it to choose a restaurant for lunch…big mistake. Besides the waiters, there was not a single Italian in the place. Rather, we were surrounded by a mob of other North Americans, all with their Rick Steve’s guides under their arms. The food was merely passable, the service perfunctory, and the atmosphere anything but authentic. We promptly realized our error of ways and ditched the guide. Thus began a covert spy mission which involved sussing out locals and following them to wherever they went to eat. This technique earned us many memorable meals, from a street-side humble pizza to a divine pasta feast in a local nunnery in Sansepolcro. Looking for the best and most authentic meals anywhere new? Easy – follow and / or ask the locals. Never hesitate to simply ask store clerks or anyone else without a Rick Steves guide under their arm which restaurants THEY would recommend. I know when I’m travelling I fully expect to land in a couple of disappointing tourist traps during my trip, but using the above technique we tend to find much more good nosh than bad nosh, and sometimes we even find truly LIFE ALTERING nosh. Here in Burgundy, we are constantly asking around to friends and family for restaurant recommendations. One name that we kept hearing was the restaurant “Ma Cuisine” in the Passage Saint-Hélène in Beaune. Much to my well…surprise…Franck surprised me with a dinner there to celebrate my 36th Birthday. Comme d’habitude, the locals’ recommendations were right on, and my delicious dinner of rabbit paté and chicken breast with a cream sauce, accompanied with an amazing selection of hand-picked local wines, REALLY made the extra year easier to swallow. *Open only 4 days a week which vary. Reserve as early as you possibly can, as this restaurant is very popular with the locals! Don’t miss this simple yet amazingly satisfying restaurant when you are in Beaune. Its low-key, understated atmosphere provides the prefect backdrop to its unfussy yet perfectly executed cuisine. In the evening enjoy a prix fixe menu for 22.00 Euros with choices such as delicious home made terrines, foie gras, kidneys, chicken breasts in cream sauce, etc. etc. The restaurant boasts one of the best – if not the best in my opinion – wine lists in Beaune. All the bottles are hand-picked, and there is a generous selection of half-bottles for those pour souls such as Franck and I who have to drive home afterwards (however, if you are staying in Le Relais du Vieux Beaune, you are in easy stumbling distance). The desserts (crucial for me) are just as simple and sublime as the rest of the meal. Franck had a gorgeous hunk or tarte tatin and I had a selection of three different kinds of crème brulée. Miam. This entry was posted in Authentic France Travel Tips, Burgundy Restaurant Reviews on November 25, 2008 by admin. I have long had a passion for diners. This began on a cross-Canada family car trip when I was 12. This particular trip has gone down in family lore as the one where my older sister Suzanne and I were utter gobshites the entire time. At one point my Dad tossed us out of the car somewhere in the middle of the Rockies and left on the roadside (clutching each other and wailing about the possibility of a Grizzly attack) to smarten up. However, the other thing I remember from this trip is my Dad pointing out the diners along the way. He would choose our meal spots using the following unassailable equation: the diner with the most trucks parked outside = the diner with the best food. As it turns out this rule of thumb works equally as well in France. The French take their food seriously, and truckers and tradesmen even more so. Franck and I have a love of French diners, also called “Les Routiers“. We were frequent patrons of the now defunct Jacky’s, and like nothing better than a lunch at the routier in Meuilley and the fabulous Café de France on the Faubourg Bretonnière in Beaune. These restaurants are guaranteed to offer serious bang for your buck – a full home cooked, authentically French, three course meal for between 11 and 13 Euros. Franck has recently become a dedicated patron of another close-by routier called “L’Auberge du Guidon” just down the road from Villers-la-Faye and Magny–les–Villers in the village of Comblanchien. If trucks are indeed anything to go by, “Le Guidon” as it is known, is THE place to eat lunch. Franck quickly initiated my Dad to lunches at Le Guidon. Often my mother and I would come home around lunchtime to an echoing house. “Le Guidion,” I would mutter, ticked that they hadn’t waited to take us as well. For a modest sum of 11,00 Euros at Le Guidon you can have a buffet of entrée choices, the dish of the day (it was boeuf bourgignon on one memorable day), and dessert (my father particularly enjoyed the chocolate mousse) PLUS a bottle of wine PLUS unlimited bread. If you really want to experience authentic France and a fabulous meal, go and enjoy lunch in a Routier. They are often indicated by a blue and red circular sign like the one on the above photo, written on the restaurant wall just below the arrow sign towards “Villers-la-Faye”. 1. They are generally open for lunch only during the week, and are closed on weekends. 2. If you are averse to more esoteric dishes such as boudin noir call ahead to find out what the dish of the day is and at the same time make a reservation. 3. Arrive between 12:00 and 12:30pm. Don’t think of arriving at 10:45am or 2:00pm – you will not get served. 4. 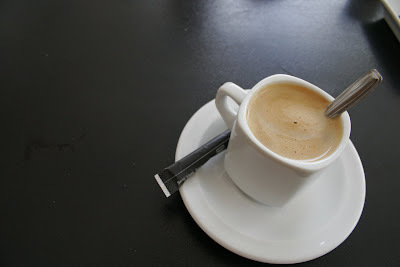 If you want to truly be authentically French, after you dessert order an espresso to finish off your meal. 5. Miraculously the no-smoking ban in French restaurants seems to be sticking, so you no longer have to worry about acquiring emphysema along with your meal. This entry was posted in Authentic France Travel Tips, Burgundy Restaurant Reviews on November 10, 2008 by admin. Franck recently took our recent guests Micca and Alan on a guided walk, and they invited him for a wonderful lunch at “L’Auberge du Côteau” in the nearby village of Villers-Fontaine. This auberge used to be great, and then it changed hands and went downhill for a while. About a year ago some new people bought it, and it is better now than it’s ever been. It’s a great spot for a simple, delicious meal in a rustic setting. Lunch menus rotate around 12-15 Euros for a “prix fixe” and you will find many Burgundian specialties such as jambon persillé, coq au vin, and the ubiquitous escargots. I don’t have a photo unfortunately, but the restaurant is the only one in Villers-Fontaine, and is just to your left as you come into the village. There is a nice patio area for the nice weather too. All in all a great address – highly recommended by Franck! *Always good idea to make a reservation if you can – it is popular! This entry was posted in Burgundy Restaurant Reviews on October 13, 2008 by admin. The closure of Jacky’s bistro in the village while awaiting a new owner has left a big hole in our restaurant repertoire. However, last week when Franck had enough of scraping wallpaper off centimetre by centimetre and I just was plain hungry (hey, I’m pregnant) we decided to give the restaurant in the neighbouring village of Meuilley a try. I’m sorry but I can’t give you anything more specific than “the restaurant in Meuilley” as I was so blinded by hunger when I arrived and dopey with repleteness when we left that I forgot to look at what street it is on. However, if you go to Meuilley (only about 5 minutes from Villers-la-Faye and Magny–les–Villers) and drive around you will surely find it. It is the only restaurant in the village and is beside the only grocery store (epicerie). If memory serves correct it is across from the Mairie, but then again I was more focused on lunch than anything else. Granted, inside the decor doesn’t have quite the charm of Jacky’s unrepentant ugliness, but the feel of the restaurant is still the same (i.e. to be avoided if you are allergic to cigarette smoke). They serve lunch only, it’s full of tradesmen, you have to arrive between 12:00 and 12:30, and there’s no menu – you get what they’re cooking that day. But usually what they’re cooking that day is pretty darn good. We had a lovely salad with hard boiled eggs and charcuterie, then the main dish of Osso Bucco with oven roasted potatoes, then we chose fromage blanc for the cheese course which came in a huge bowl with a big dollop of cream. For dessert we could choose from a bowl of fruit (fruit? for dessert??? I’m not that french yet), several flavours of ice cream, or the homemade apple tart. We both went, bien sur, for the tart which was delicious and washed it down with an espresso. All of this, plus bread and a small-ish pitcher of red wine which I sadly couldn’t indulge in was included in the price per head of 12.00 Euros. Make sure you drop by or phone and make a reservation first, as the restaurant understandably fills up mighty fast. I will try to find a phone number by the time I post this restaurant review in The Grape News I’m working on. This entry was posted in Burgundy Restaurant Reviews on November 22, 2007 by admin.